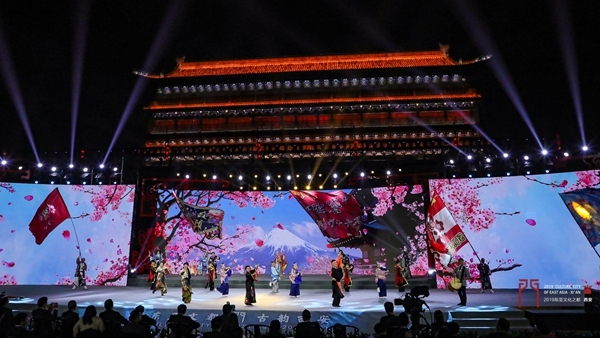 From 26 to 28 March 2019, a series of activities in celebration of Xi’an as one of the three selected cities of 2019 Culture Cities of East Asia (CCEA) were held in Xi’an City, Shaanxi Province. Mr. Zhang Xu, Vice Minister of Culture and Tourism Ministry of China, Mr. Hu Minglang, Vice Governor of Shaanxi Provincial People’s Government, Mr. HOR Monirath, Secretary of State of Tourism Ministry of Cambodia, Mr. Li Mingyuan, Mayor of Xi’an Municipal People’s Government and more than 200 delegates from the Republic of Korea (ROK), Japan, Cambodia, Thailand, Malaysia and cities of China were present at the grand opening ceremony. On behalf of ASEAN-China Centre (ACC) and upon the invitation of Xi’an Municipal People’s Government, Ms. Kong Roatlomang, Director of Education, Culture and Tourism Division (ECTD) of ACC and Mr. Li Qianguo, Tourism Officer of ACC attended this event. Wonderful cultural performances from China, Japan and the ROK were presented at the opening ceremony. During the occasions, Ms. Kong met and exchanged with officials and delegates of Xi’an, Toshima-ku of Tokyo and Incheon of the ROK, which are the Culture Cities of East Asia in 2019. She visited cultural and tourism attractions in Xi’an, and exchanged views with other delegates on culture, tourism and ASEAN-China partnership. Ms. Kong also gave interviews to local media including Xi’an Daily, Xi’an Evening News and Shaanxi TV and shared her opinions on heritage preservation, cultural exchanges and promotion of city as tourism destination. The CCEA was jointly initiated by the Culture Ministers of China, Japan and the ROK with a view to promoting cultural exchanges among cities in East Asia and actively introducing the diverse cultures of the region to the world. In 2013, Quanzhou of China, Yokohama of Japan and Kwangju of the ROK were selected as the first batch of CCEA.